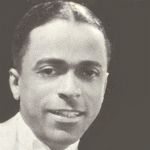 Claude Hopkins (August 24, 1903 – February 19, 1984) was an American jazz stride pianist and bandleader. Claude Hopkins was born in Alexandria, Virginia in 1903. His parents were on the faculty of Howard University. A highly talented stride piano player and arranger, he left home at the age of only 21 as a sideman with the Wilbur Sweatman Orchestra but stayed less than a year. In 1925, he left for Europe as the musical director of “The Revue Negre”, which starred Josephine Baker with Sidney Bechet in the band. Later, (1932–36) he led a fairly successful Harlem band. This was his most successful period with long residencies at the Savoy and Roseland ballrooms and at the Cotton Club. In 1937 he took his band on the road with a great deal of success. He broke up the band in 1940 and used his arranging talents working for several non-jazz band leaders and for CBS. In 1948 he led a “novelty” band briefly but took a jazz band into The Cafe Society in 1950.